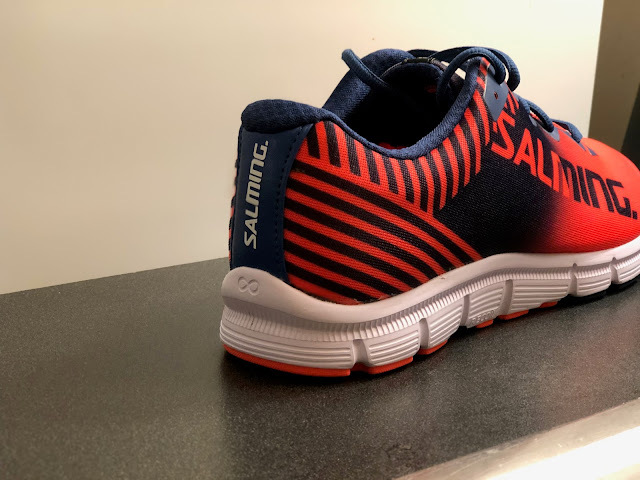 Road Trail Run: Salming Miles Lite Review: Sweden Strikes Back! 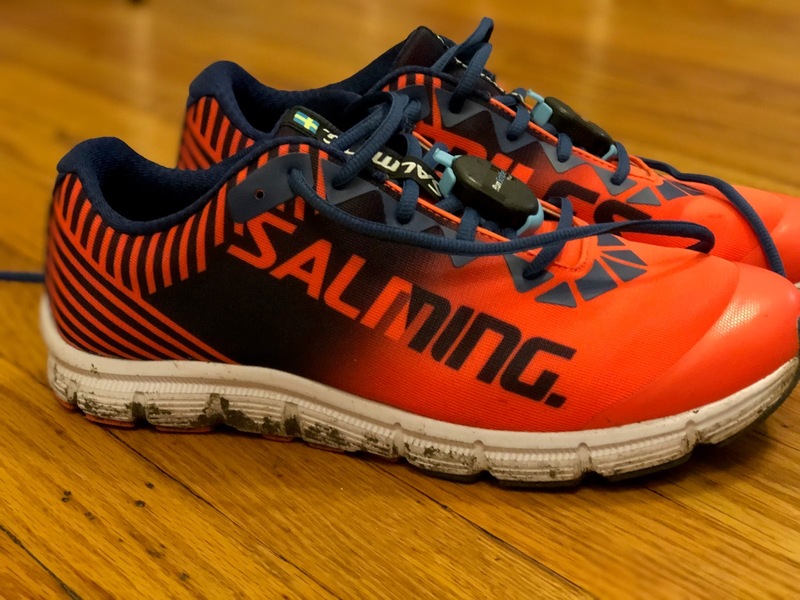 Salming Miles Lite Review: Sweden Strikes Back! Joining me for this review is my fiancée, Kathleen, a former collegiate distance runner with PRs of 18:03 for 5,000m and 37:52 for 10,000m. While she still races from time-to-time, she's scaled back the milage nowadays, and values a comfortable ride rather than a racing-oriented trainer. 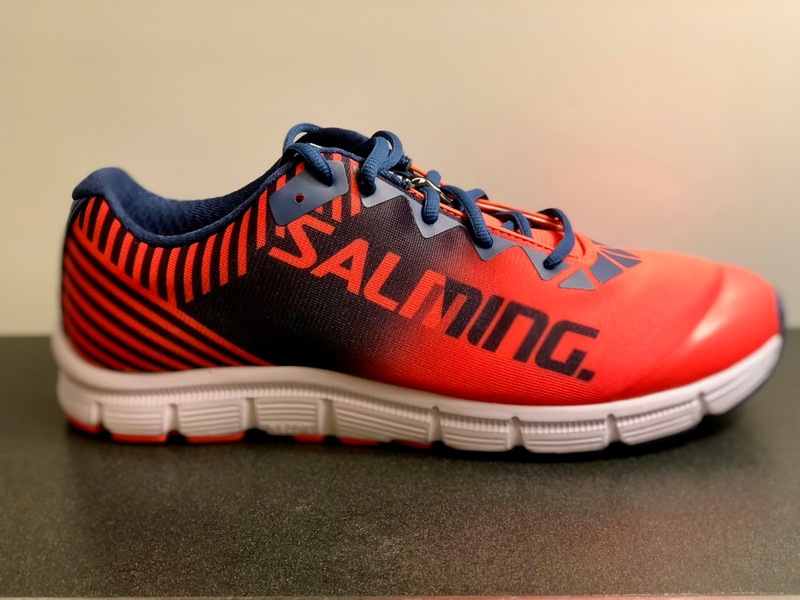 Salming, hailing from Sweden, is a brand that's been on the periphery here in the United States. 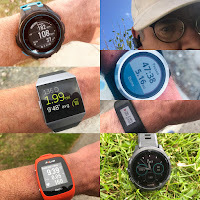 Certainly you can spot a pair or two at your next road race, but you'd be hard-pressed to find them at your local running store, and the other sports they manufacture equipment for - squash and handball - aren't exactly your "mainstream" options. 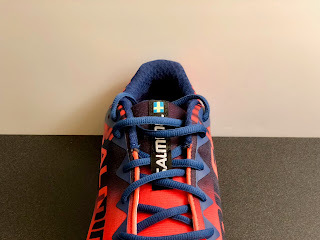 Not to disparage the brand - they've certainly been manufacturing shoes a long time - but just to provide clarity if you opened this review thinking Salomon had yet another new shoe. Despite relative obscurity, we've seen these shoes before here at RTR: the EnRoute received overall praise from our team in February 2017, and the Speed 6, more of a predecessor or ancestor to today's Miles Lite, received mixed reviews. Excited about the possibility of a new lightweight trainer, Salming sent us out a couple test pairs of the Miles Lite to try out. Salming's slogan, "No Nonsense," about describes what you get here. The Miles Lite is a 8.9 oz/ 252 g (Men's US9) performance trainer with a 23mm heel and 19 mm forefoot and $130 USD price tag according to Running Warehouse here). It's available in one colorway per gender - Orange/Blue for men and Grey/Black (inclusive of some pink) for women. We liked the look of the shoe out of the box, and were excited to pound some miles in our Swedish rockets. At the onset, Kathleen and I both found the Miles Lite to run pretty long. I'm an 8.5/9, usually, and the 8.5 from Salming was about a quarter size too big. Not the end of the world with winter socks. Kathleen generally wears an 8 or 8.5, and her 8.5 was pretty big. If you're on the cusp, I'd recommend sizing down. The toe box, to the shoe's credit, is pretty wide and will fit most feet, I imagine. The striping on the rear of the shoe gives some visual pop. We were both pleasantly surprised with the look and feel of the shoe, sizing quirks not withstanding. The upper is a singular piece, besides the rubber toecap, and is quite comfortable and surprisingly breathable - it looks more synthetic than some other options out there, and certainly more so than a knit upper, but in practice it's just fine. Kathleen noted that it felt warmer than her Epic Reacts on some runs in the high-20s and mid-30s! My orange and blue pair ("Orange Flame/Limoges Blue") wasn't my favorite aesthetic, but isn't a bad looking shoe by any means - I especially like the stripe-detailing at the heel. The women's pair ("Grey/Black") is more subdued, but we liked the pink accenting. Google reveals that there's a neon-yellow color way for men, but it's not available in the United States. Oh well. The Swedish flag is a nice accent. We were both pretty impressed with the lockdown of the shoe, despite the unease in sizing. The tongue is comfortable and doesn't slide around, and the laces are held down with a "Salming" branded overlay that keeps everything neatly in place. I ran with my RunScribe+ in the laces and felt no discomfort or hot spots. In sum, it's a comfortable, clean shoe, true to the "no-frills" tagline. The wordmark on the lateral side is a little... big, but considering Salming doesn't seem to have a logo, it's not the worst design choice. The Swedish flag on the tongue is nice, too. 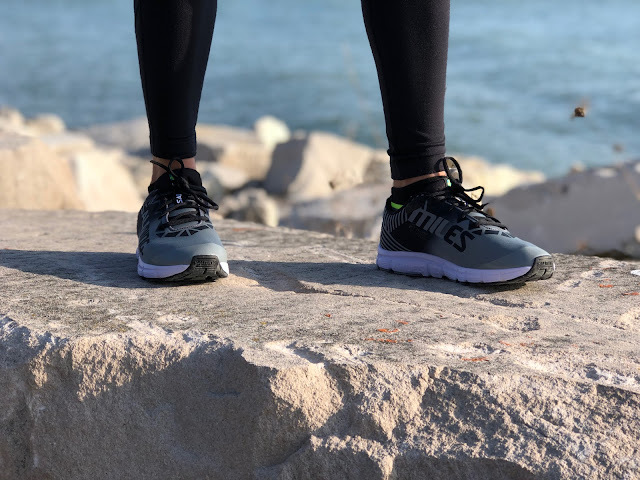 The Miles Lite has a 4mm drop, lower than either of our "usual" trainers, the Nike Epic React (Kathleen's go-to), the Nike Zoom Fly Flyknit, which are both around 10mm. The 4mm is the same as the Enda Iten, which I have been testing (and of which I'm a fan). Overall, I think we reacted differently - Kathleen felt that the shoe was noticeably too flat and somewhat uncomfortable. I think the stiff rubber outsole (to be covered later) also gave her the impression of a flat, stiff shoe. Coming from the Enda Iten, I was surprised - I would have guessed the Iten had a low (4mm) drop, but I wouldn't have pinned the Salming for the same. It certainly feels more "traditional" a la the Nike Pegasus or Brooks Ghost, while the Enda feels like you're right down there with the road. Just different ways to approach the same idea. The midsole material is what Salming calls "RECOIL" mixed with "SoftFOAM," two proprietary cushioning mechanisms that I'm not altogether familiar with. The website describes RECOL as "a super lightweight cushioning compound that releases a high rebound energy effect." Okay... not altogether helpful, either. I had to go off Salming USA's website to a review from our very own Derek Li, which suggested it was an EVA-foam flavor. Makes sense - to the touch, it doesn't feel like a TPU (think Adidas Boost). It's soft enough. Nothing fancy. No frills, you might say. Both Kathleen and I were pleasantly surprised, overall, by the cushioning. Coming from the Epic React, Kathleen felt this shoe was more responsive - provided more road-feel - and just a little flatter than what she was used to. I was coming "up" in cushioning from the Enda Iten, and it's certainly a slightly softer feel than the Iten. So on a scale from Nike Epic React to Enda Iten, the Miles Lite is... in the middle (could there be a more useless scale to most readers?). 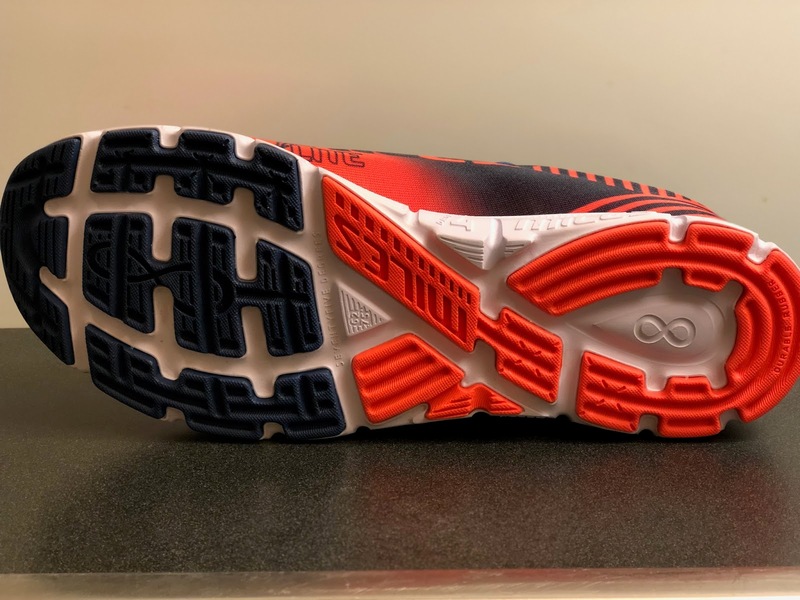 The cushioning actually reminded me a lot of the Saucony Freedom ISO 2 - that shoe wasn't universal beloved here at RTR (review), nor is it EVA-powered (opting for TPU instead), but the profile and ride are pretty similar. Ultimately, I'd leave you with this, regarding the midsole: don't go picking up the Miles Lite for those days when your legs are dead and you just need something soft underfoot to feet. For a performance trainer, the Miles Lite is softer than the Enda Iten, Nike Zoom Fly (old), or Nike Streak 6, but it's not a cushy shoe. If you're looking for a shoe to hammer long runs, bang out a tempo, or hop in the occasional race that won't trash your legs, though, this could be a a great pick. Briefly, we'll touch on the outsole, because we were both happy with its performance in some wet and often pretty slick conditions. We covered basically all surfaces available (asphalt, concrete, painted elements, crushed gravel, wood chips, limestone, snow, and goose poop) and came away dually impressed with how grippy this shoe is. I often feel uncomfortable in some of the more recent Nike trainers (Pegasus Turbo, Epic React, Zoom Fly), as they seem to sacrifice outsole material for weight. That's a compromise you need to make sometimes, but I'm glad it's not made here - I'm confident this shoe will be a strong winter trainer if you live somewhere cold. The cost of this outsole durability, however, may be flexibility - the Miles Lite is considerably more rigid than other shoes in our arsenal, and it certainly tacks on weight. Light and flexible, this is not. 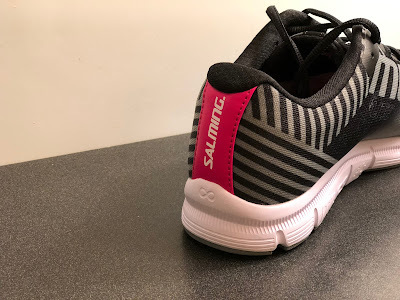 In some cases (winter running, as noted), this trade-off may be worth it, but I wouldn't necessarily recommend this shoe to someone focusing primarily on treadmill running. 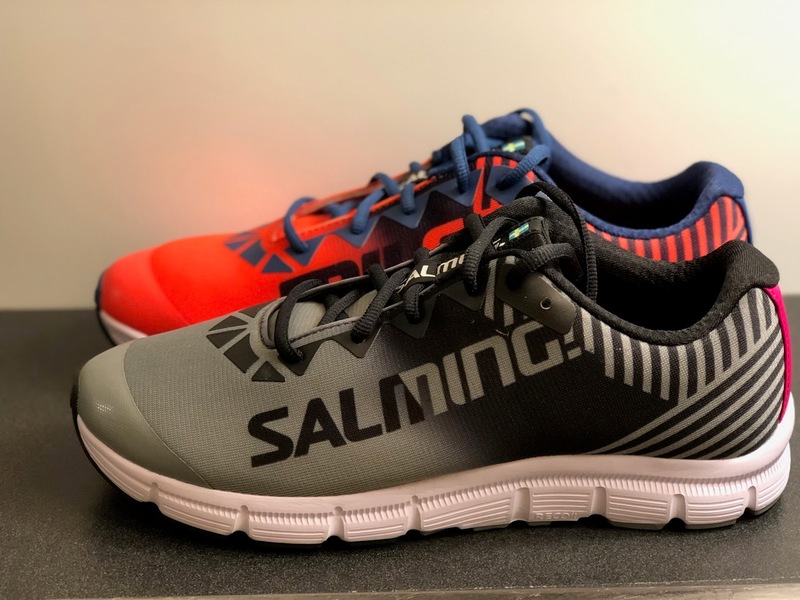 The "lightweight neutral trainer" category is becoming more and more crowded by the day, and the Salming Miles Lite certainly has its work cut out for it. But as a substantial improvement over the older iteration (and its Salming predecessors), the Miles Lite is off to a strong start. Don't take the 'No-Frills Running' tagline as just advertising - Salming takes that motto seriously. With a simple upper, a soft-not-cushy EVA midsole, and a durable, grippy outsole, this is a no-frills, easy-to-wear trainer that can handle a wide variety of paces. All that said - don't go in expecting Nike React-foam level cushion or Saucony Kinvara-level weight - neither of them are here. At $130, the Miles Lite is not a must-buy by any means, but if you find the looks catch your eye, you want something with a little Swedish flair, or you're looking for something that you know will get you around those icy corners this winter, the Miles Lite is certainly worth your consideration. Miles Lite feels a little more like a running shoe (we found the Freedom ISO 2 to be too flat), but I do like the bounce in the EVERUN midsole material. The Epic React is soft, and the React foam midsole is bouncier and more flexible than that of the Miles Lite. Still, the outsole on the Epic React feels like running on a soap bar at times, and many consider the React foam to feel uneven at different temperatures. There's certainly more to the Miles Lite than the Iten, which feels more "natural" and low to the ground. Both are fortunately grippy, comfortable shoes, but a runner who is not used to the 4mm drop may have better luck in the Salming, owing to its stack height. Michael is a third-year law student at Northwestern University in Chicago, with an interest in patent and intellectual property law. Prior to law school, he competed collegiately at Washington University in St. Louis (10,000m PR of 30:21). He recently finished 2nd at the Chicago Half-Marathon in a PR of 67:43, and was the top Illinois finisher in the 2017 Boston Marathon (2:33:03, 82nd overall). Michael is a gadget and running nerd, and has pipe dreams of running the Olympics Trials marathon standard. His pre-race breakfast is, and will always be, Pop-Tarts. The product reviewed in this article were provided at no cost. The opinions herein are entirely the authors'. 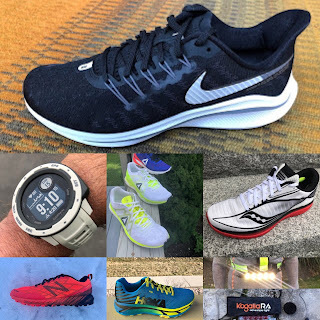 VISIT our 2019 Previews Page HERE for 2019 run shoe, apparel, and gear previews. Thanks for this. It is a really well written review. Road Trail Run 2018 Holiday Savings Round Up!